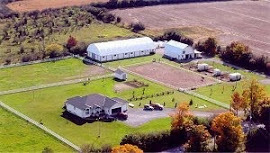 Hadherway Farms is dedicated to providing a show venue that offers competitors a level playing field according to their age and skill level. With emphasis on fun in a friendly, professional atmosphere. We also ensure that our shows are a stepping stone to the A circuit by designing our jump courses with horse friendly obstacles that challenge the rider. Classes are offered in our sand ring to our up and coming riders with walk/trot hack classes and cross rails. More experienced riders or those moving up will compete in our beautiful grass ring (each show offers new course designs and fill) with classes offered to 3 foot. Our generous prizes are donated by local businesses and our shows are run by volunteer horse enthusiasts. Spectators are encouraged. Prize lists and more information to follow. Prize lists, dressage tests and more information to follow.